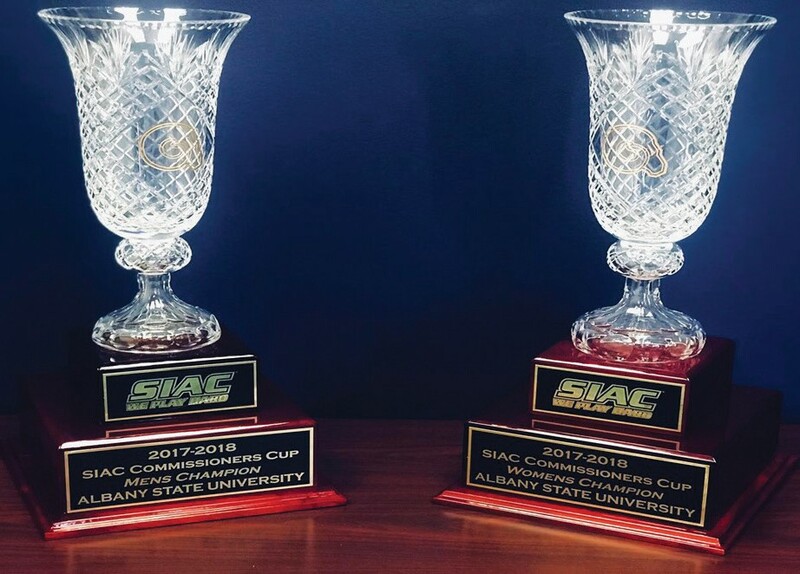 The Albany State University Athletics Department has officially closed the 2017-2018 academic year as the best in the Southern Intercollegiate Athletic Conference. The Golden Rams made it a clean sweep as they were announced as the winners of this year’s Commissioner’s Cup for the achievements of both their women’s and men’s athletic programs. This is the first time ASU has won both awards in the same year. The Commissioner’s Cup is an all-sports award presented at the end of each academic year to the league’s top performing school in conference play and is based on a point system, reflecting the finish of each team in conference play. It is presented to the athletic department within the conference that has excelled in both men’s and women’s sports. ASU claimed the Commissioner’s Cup on the men’s side for the second straight year, and was awarded the honor for their women’s programs for the first time since 2013-14. The scoring system is as follows: 10 points for conference titles, seven points for runner-up championship titles, and four points for third place championship titles. This past season, the Golden Rams won conference championships in women’s cross country, men’s golf, baseball and softball and were runner-up for the title in men’s cross country. The Albany State men had 31 points followed by Morehouse (27) and Benedict (25), to round out the top three. On the women’s side, ASU had 31 points, followed by Benedict (21) and Tuskegee (17).